As much as Paris is magnificent by day, it is absolutely magic by night. Imagine the many bridges, monuments, churches, fountains, canals, that impressed you during the day, lit up by night. 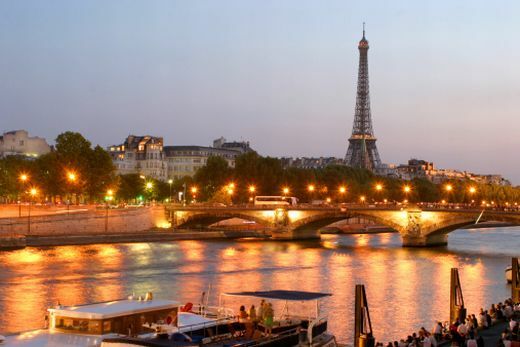 This beautiful City of Lights is so chic and romantic that you cannot stop gazing outside your luxury car window driven by Paris Limousine Car Service chauffeur. While you sit back and totally enjoy the Parisian illuminated views in one of our comfortable and safe limousine cars specially selected by you, our chauffeur will take you through the streets following the Seine at the heart of Paris. Upon your desire, to make your night even more special, we will drop you off at the departure station of the Bateaux to see the amazing shining Paris and the Eiffel Tower spectacular light show every hour from Seine itself when the boat takes off and why not enjoy a romantic dinner. Whether you plan to spend the evening at a theatre show in Opera – Paris, or attend one of the amazing concerts at the Palais Omnisports, or go dancing in one of top Paris dance clubs or nightclubs, or have dinner combined with a marvelous show in one of the unforgettable legendary cabarets of Paris like Moulin Rouge, Lido or Crazy Horse – our qualified uniformed chauffeur will be at your disposal from the very beginning till the end and take you back to your hotel or address in elegance taking part in your extraordinary experience.